Groomsmen – Dress Codes and Getting The Right Look! Choosing the right dress codes will be a major element in making sure that you set the right tone for your big day! This is really important, not only for your groomsmen but for your guests aswell – noone likes to rock up to an event either under or over dressed! There are five main dress codes that you may consider for your wedding , these will all help you to determine the formality of the occasion and create the perfect atmosphere for your fabulous wedding! A tuxedo or dinner suit is possibly the sexiest most masculine suit that you will ever wear … think James Bond! 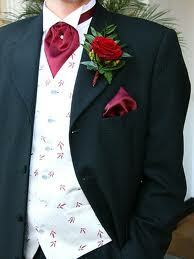 Traditionally with a satin trim lapel, white or ivory shirt and formal collar and a black bow tie. This style brings a modern twist to the classic black tie. Team with up with a slim boy tie or sneakers if that is what reflects your personality most! Whether it’s a lounge suit or a black tie suit ‘formal means vest’! It’s all about complementing the jacket and pants with a three piece suit! With this casual style suit there are no actual rules – you don’t need a tie and the colour is up to you. The prefect choice for a garden wedding. Basically anything goes – suits can be replaced with trousers and jackets are not essential – even thongs can be exceptable if you are having super casual beach wedding. Finding The Perfect Wedding Dress…! All heads will turn as the beautiful bride makes her grand entrance on the biggest day of her life! As we all know finding your dress needs to be just like finding your groom … the perfect fit!! and as we also know that we are all unique we have to consider both personal taste and of course our body shape awhen making the choice! Make sure that you do a little bit of research about what will best enhance your wonderful figure! Hips and shoulders are a similar width with a defined waistline. Choose from A-line, Ball Gown, Princess Line or Fishtail. Hips are wider than shoulders. Look for A-line, Asymmetrical, Princess Line. Hips, shoulders and waist are similar width. Look for Ball Gown, Sheath, Empire Line. Shoulders are wider with similar hip and waist. Choose from A-line, Asymmetrical or Ball Gown. Shoulders are wider than hips. Look for: Cocktail or Fit n Flair. School Fundraising Ideas for Charity. There are so many worthy causes and possible reasons that you may need to raise funds for your School, Sports Club, Community Group or Registered Charity. Often the hardest thing to do is rally the support and enthusiasm of the people around you in order to reach your goal! The first step is to let people know why you are fundraising and why you need their help (e.g. new sports equipment for your school). Also confirm the amount of cash you are hoping to raise as this will help parents, relatives, friends and even corporate sponsors to understand your aims and to help you achieve them. If you have a regular newsletter or online community, be sure to include your fundraisers in an article, blog or post and also to include the correct links to your sponsors, include their logos and information so that they can help drive people towards your goal too, plus it is great advertising and the more you can include them in your event the more support they are likely to provide. Publicise your event on the products that you choose! Perhaps you are having a ‘fun-run’ to raise money for a local charity, simply send through the event details and your logo and we will create the perfect merchandise that you can sell on the day to raise some extra cash. You can email us your school crest, sports logo, class list or group photo along with your design preferences or uniform colours and our experienced team will design a cooler to suit your requirements. This is a great way to raise extra money and market your school at the same time, be sure to include your school motto or mission statement! Perhaps you are celebrating your centenary year, having an open day or even a series of events? Whatever you are celebrating we can help – due to our unique manufacturing and digital process we can print several designs across your ordered volume for little or no extra cost. A great tool if you have a few different events coming up and want to print them all at once! You could even consider this for your sports day or events where you are split into ‘houses’ as you can print a different colour for each house. We can provide a blank template onto which your group or individual child can paint, draw or sketch their very own piece of art! It could be a self-portrait, handprint, simple drawing or elaborate design. Each piece of art can then be scanned and made into your very own cooler – a fantastic gift idea for any occasion! Do you have a collection of photographs taken at your school or club, perhaps headshots for your yearbook or action shots from a specific event? Why not send us your images along with a names list to match and we can print a picture along with an individual name and class number or group logo as a memento of the event or year! Remember, the more you sell the bigger your profit margin … Coolaz Fundraising Packages are a great way to increase sales and raise extra money for your fundraiser! We can offer you advice about our recommended retail value so that you make the most sales you possibly can. We will also give you a fantastic unit price, this will be based on the total quantity that you require and of course the more you order the cheaper this unit price becomes! The Coolaz Team have heaps of ideas for fundraising, we have worked with many charities and organisations to help boost support for various causes across Australia. For more information and help with your next fundraising event please do not hesitate to get in touch. If you can tell us a little bit about what you are doing and the charity or cause you are raising funds for then we will do our best to offer you a substantial discount on your order! Contact us for more details. Some Wedding Facts, Truths, Traditions and Ideas for 2012! The Average Age of an Australian Bride was 29 and Groom 31 years old, in 2009. There are approximately 110,000 Weddings in Australia every year! The Average Cost of a wedding is around $30,000!! The Average Engagement Length is 16 months. 80% of brides will plan a Formal Wedding. Enagement Rings – 74% of brides receive a diamond ring, 60% of those are involved in choosing their rint, with 3% choosing it by themselves! Wedding Ring – Ancient Egyptians belived that the ‘vein of love’ ran from the 4th finger on the left hand, hence the reason that married couples wear their ring in this position. Queen Victoria made white the traditional colour of chice when she wore a white gwon in 1840 to marry Prince Albert. The colour white is also said to be a symbol of joyous celebration and purity. On average brides spend 200 hours on planning their big day! Something Blue – The collection of items that is considered lucky for a bride to take to her wedding is given in the rhyme ‘something old, something new, somthing borrowed, something blue’. Yet another trend for 2012 wedding themes brings us the Rustic Woodland Country look, think natural wood effects, shades of green, love birds outdoor settings and enchanting tree decorations. To suit both outdoor and indoor weddings this woodland rustic chic can be carried across all decorations, bouquets and bombonierre! You can combine this with a country music theme or a barn dance style wedding for a really unique wedding. Don’t just think brown … Shades of teal mixed with birds, twigs, moss and peacock feathers are the perfect complement for a rustic wedding. Sparkling Diamond Themed Weddings, Designs and Ideas! A diamond ring is a thoughtful gift of promise, an engagement of two people with the same intentions of marriage. They are so unique, and to most a diamond will symbolise love and eternity. The expression ‘diamonds are forever’ is in fact not far from the truth, since diamonds are the hardest of all the gemstones and will last a very long time… this too is symbolic of a love worthy of marriage that is also said to last an eternity. As much as we would not like to wish the summer away the popularity of a winter wedding is certainly on the up and there will be plenty of brides who will be busy planning their fairytale winter wedding for this year’s snowy season! The good news is that sleeves and high necklines are back in so remember that when you choose your wintery bridal gown. Plus you can add an elegant faux fur bolero or a snug cashmere wrap for some extra warmth. When thinking about your wedding colours and wintery theme you should go for a combination of white, ivory, cream and pale blue flowers for a cool effect. There is no shortage of the popular wedding flowers in winter. Gerberas (gerber daisies) in their multitude of colours are available, as are tulips, roses and chrysanthemums. Candles are also perfect for a winter wedding as they create a warm romantic atmosphere, plus there are so many different colours available that you will have no problem matching the scheme of your wedding.